Transafrika in Etappen: Diese Reise führte uns hauptsächlich durch Mali und dann zurück zu unserem Parkplatz Sukuta Camping Gambia. Leider stellten wir dies erst 32 Kilometer später fest und durften eine halbe Stunde über holperige Steine und sandige Tracks zurückgondeln. Die Konfluenz liegt in einer weiten Senke mit Kamelgras. Nur 2 km südlich fließt der Niger. Weitere Reiseberichte in Afrika unter www.afritracks.de. Africa Overland in stages. This trip lead us mainly through Mali heading back to our car park at Sukuta Camping in Gambia. Coming from Mopti and 16N 1W we carried on to Tombouctou along the north bank of Niger River. This is not the safest area in the Sahara, so it is important to check the security situation before. We had positive feedback from Mopti residents, and the Gendarmerie Checkpoint at Bourem confirmed the actually good safety situation, too. Short after Téméra village, just 1.4 km off the main track, this could have been our easiest Confluence so far. But I just had in mind that it was already visited before. When the navigator checked her list and realised that I was wrong, we already had to drive back 32km through a mixture of deep sandy tracks and corrugation. After leaving the main track it was an easy drive. 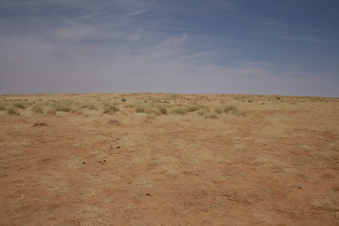 The Confluence is located in a small depression surrounded by camel grass dotted sand just 2km north of the Niger River.